Finding homemade 100% whole-grain bread that tastes good with a satisfying crumb and crust has been a lifelong pursuit. The ongoing search took me back to Peter Reinhart’s Whole Grain Breads (2007) and Multigrain Struan. I’m also a fan of Great Harvest Bread Company’s Dakota Bread, with sunflower seeds, sesame seeds, and pumpkin seeds on the outside. Though Dakota Bread is indeed 100% whole wheat, it’s a little too soft for me. For breakfast toast, my chewier 15-Grain Breakfast Bread based on a Cook’s Illustrated whole-grain bread recipe is quite satisfying. I brought elements of the three breads together in this recipe for Dakota Struan Bread. 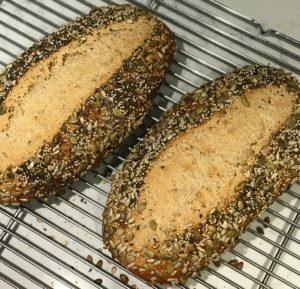 It uses Peter Reinhart’s method from WGB (as Whole Grain Bread is known in online bread communities). Amounts below are for one free-form loaf shaped as a bâtard. Amounts for two loaves are in parentheses. Mix all the soaker ingredients together in a bowl for about 1 minute, until all of the flour is hydrated and the ingredients form a thick porridge-like dough. Cover loosely with plastic wrap and leave at room temperature 12 to 24 hours. (If it will be more than 24 hours, place the soaker in the refrigerator; it will be good for up to 3 days.) Remove the soaker from the refrigerator 2 hours before mixing the final dough to take off the chill. Mix the biga ingredients together in a bowl to form a ball of dough. Using wet hands, knead the dough in the bowl for 2 minutes to be sure all of the ingredients are evenly distributed and the flour is fully hydrated. The dough should feel very tacky. Let the dough rest for 5 minutes, then knead it again with wet hands for 1 minute. The dough will become smoother but still be tacky. About 2 hours before mixing the final dough, remove the biga from the refrigerator to take off the chill. It will have risen slightly but need not have risen significantly in order to use it in the final dough. The seed mix will be applied to the outside of the formed loaf. This formulation makes about 1 cup, enough for 2-3 loaves. Using the metal pastry scraper, chop the soaker and the biga into 12 smaller pieces each. Sprinkle a little extra flour over these pre-doughs to keep the pieces from sticking back to each other. Put the pre-dough pieces and all the other ingredients into the mixer. Mix on slow speed for 1 minute to bring the ingredients together into a ball. Continue mixing for 2 to 3 more minutes until the pre-doughs became cohesive and assimilated into each other. Add more flour and water as needed until the dough is soft and slightly sticky. Resume kneading the dough for 1 minute to strengthen the gluten and make any final flour or water adjustments. The dough should have strength and pass the windowpane test yet still feel soft, supple, and very tacky. Form the dough into a ball and place it in the prepared bowl, rolling to coat with oil. Cover loosely with plastic wrap and let rise at room temperature for approximately 45 to 60 minutes until it is about 1 1/2 times its original size. Transfer the risen dough to a lightly floured work surface and form into a freestanding bâtard and place it on parchment paper. Brush the loaf with beaten egg white and sprinkle with about 1/3 cup of the seed mix. Cover loosely with plastic wrap and let rise at room temperature for 45-60 minutes, until about 1 1/2 times its original size. Preheat the oven to 425ºF at least an hour before baking with the pizza stone on a lower rack and an upper rack to hold a sheet pan for steam. Slash the top with a lâme or very sharp knife. Using a pizza peel under the parchment paper, slide the loaf including the parchment paper onto the pizza stone. Pour 1 cup of water into the steam pan. Bake for 20 minutes. Rotate the loaf 180 degrees and continue baking 20-25 more minutes, until the loaf is a rich brown on all sides, sounds hollow when thumped on the bottom, and registers at least 195ºF in the center. Transfer bread to a cooling rack and allow it to cool for at least 1 hour before serving.